Where can we find wild durians in Singapore? The National Parks Board had planted out the saplings from the seeds at Mount faber Park 2 and Jalan Jurong Kecil 1. Where to buy them in Sarawak? According to Simon Longman, he suggested going to Kuching Sunday Market in Jalan Satok, Kuching, Sarawak in December or January. One such wild durian may cost you RM 15 - 20. It cost RM30 for 4 in the whole tamu’ (Sunday market). 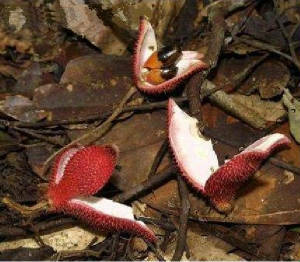 According to Sabah Tourism, Culture and Environment Minister Datuk Masidi Manjum, in interior Ranau sukang (Durio gravolens) are plentiful. Wild durian known as sukang or tabelak, the fruit is also called 'durian hutan', is mainly found growing wild in the jungles of Sabah. 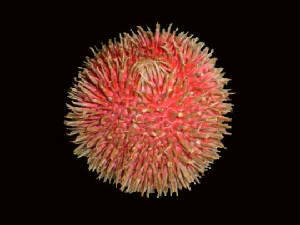 The sukang's main attraction is its red-coloured flesh. 'That's the main thing that makes it stand out,' he said, adding that this type of durian also fetched a lower price than the more common fruit. The small-sized fruits, some about the size of a sepak takraw ball, are sold for as little as RM2 to RM3 when they are in season. It is more pungent and has a carrot-like flavour. 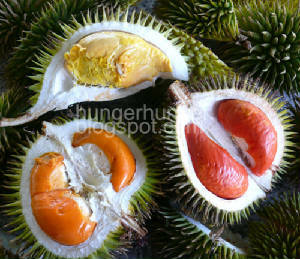 Lahong (Durio Dulcis) - This is from East Borneo. 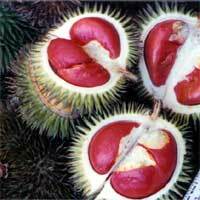 A wild Burning red skin durian. Fruit is quite round. Yellow flesh is so creamy, soft and sweet just like caramel. Despite its sweet taste, the smell of this type of Dorian is very provoking. Fruit 6-10" in diameter, often collected in the jungle and quite difficult to open, with a deep caramel flavored flesh. Proabably the sweetest of all the durians. 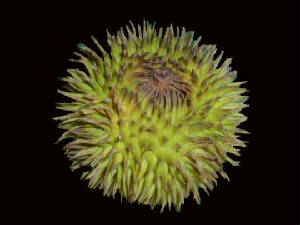 The spines are very prominent in this durian, making the fruit resemble a coiled up sea urchin. Description: Very large tree to 130ft. Has glossy leaves with a golden color underneath. Uses: Eaten fresh. The seeds are roasted and eaten. Native Range: Native to Borneo. Green skin color and smaller size. The average weight is around 20-500gram, the smallest Dorian of all. It has a sweet yellow flesh but provoking smell. Small fruited, wild durian of Borneo. Fruits are bright green with a hairy appearance, and strong odor. 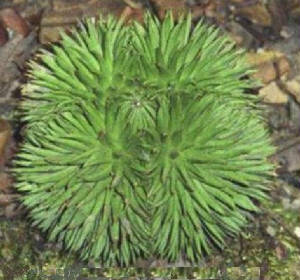 Occasionally cultivated in Borneo. 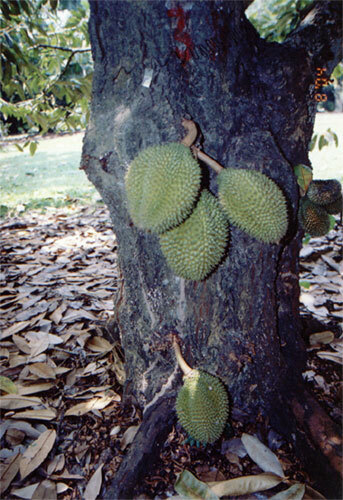 Description: Large tree, often larger than the common durian. 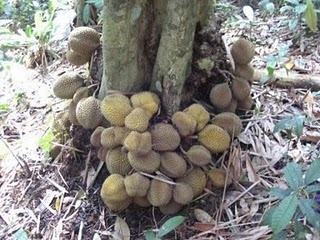 Unlike most other durians which have five main lobes, the kerantongan has only four. Uses: Fruits are eaten fresh. 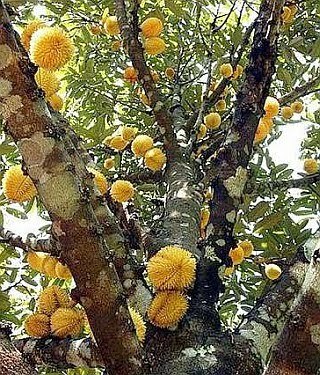 Durian, Durian antu, Durian burong, Durian enggang, Durian loiang, Durian lahung, Lai hengang, Lai kayo, Lai koko, Mehawan, Tupaloh, Tuwola pumpulu. Fruits ca. 35 mm long, bright red, dehiscent, with short spines, seeds with small red aril which covers only a small part of the black seeds. Fruits ca. 150 mm long, yellow-reddish, capsule with long spines, seeds enclosed in red aril. the fruit of D. dulcis drops unopened and has dark yellow flesh. Durian suluk, also known as durian siunggong, is a natural hybrid between D. zibethinus and D. graveolens, and retains the flavour and texture of D. zibethinus with subtle burnt Caramel overtones of D. graveolens. 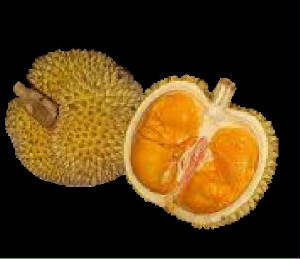 Durian simpor is a mild-flavoured, yellow-fleshed variant of D. graveolens. Also known as "Durian Hutan"
Description: No cultivation information is available, although this species occurs wild in the rainforests of Borneo alongside several of its close relatives. A unique feature of this species is that it flowers and bears fruit directly from lower portions of the trunk. Large clusters of the fruit hang from the tree just above ground level.